In its most general sense, the word earthquake is used to describe any seismic event—whether natural or caused by humans—that generates seismic waves. Earthquakes are caused mostly by rupture of geological faults, but also by other events such as volcanic activity, landslides, mine blasts, and nuclear tests. An earthquake's point of initial rupture is called its focus or hypocenter. The epicenter is the point at ground level directly above the hypocenter. This is so because the energy released in an earthquake, and thus its magnitude, is proportional to the area of the fault that ruptures and the stress drop. Therefore, the longer the length and the wider the width of the faulted area, the larger the resulting magnitude. The topmost, brittle part of the Earth's crust, and the cool slabs of the tectonic plates that are descending down into the hot mantle, are the only parts of our planet which can store elastic energy and release it in fault ruptures. Rocks hotter than about 300 °C (572 °F) flow in response to stress; they do not rupture in earthquakes. The maximum observed lengths of ruptures and mapped faults (which may break in a single rupture) are approximately 1,000 km (620 mi). 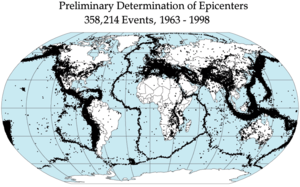 Examples are the earthquakes in Chile, 1960; Alaska, 1957; Sumatra, 2004, all in subduction zones. The longest earthquake ruptures on strike-slip faults, like the San Andreas Fault (1857, 1906), the North Anatolian Fault in Turkey (1939) and the Denali Fault in Alaska (2002), are about half to one third as long as the lengths along subducting plate margins, and those along normal faults are even shorter. The most important parameter controlling the maximum earthquake magnitude on a fault is however not the maximum available length, but the available width because the latter varies by a factor of 20. Along converging plate margins, the dip angle of the rupture plane is very shallow, typically about 10 degrees. Thus the width of the plane within the top brittle crust of the Earth can become 50–100 km (31–62 mi) (Japan, 2011; Alaska, 1964), making the most powerful earthquakes possible. Strike-slip faults tend to be oriented near vertically, resulting in an approximate width of 10 km (6.2 mi) within the brittle crust, thus earthquakes with magnitudes much larger than 8 are not possible. Maximum magnitudes along many normal faults are even more limited because many of them are located along spreading centers, as in Iceland, where the thickness of the brittle layer is only about six kilometres (3.7 mi). The majority of tectonic earthquakes originate at the ring of fire in depths not exceeding tens of kilometers. Earthquakes occurring at a depth of less than 70 km (43 mi) are classified as 'shallow-focus' earthquakes, while those with a focal-depth between 70 and 300 km (43 and 186 mi) are commonly termed 'mid-focus' or 'intermediate-depth' earthquakes. In subduction zones, where older and colder oceanic crust descends beneath another tectonic plate, Deep-focus earthquakes may occur at much greater depths (ranging from 300 to 700 km (190 to 430 mi)). These seismically active areas of subduction are known as Wadati–Benioff zones. Deep-focus earthquakes occur at a depth where the subducted lithosphere should no longer be brittle, due to the high temperature and pressure. A possible mechanism for the generation of deep-focus earthquakes is faulting caused by olivine undergoing a phase transition into a spinel structure. A tectonic earthquake begins by an initial rupture at a point on the fault surface, a process known as nucleation. The scale of the nucleation zone is uncertain, with some evidence, such as the rupture dimensions of the smallest earthquakes, suggesting that it is smaller than 100 m (330 ft) while other evidence, such as a slow component revealed by low-frequency spectra of some earthquakes, suggest that it is larger. The possibility that the nucleation involves some sort of preparation process is supported by the observation that about 40% of earthquakes are preceded by foreshocks. 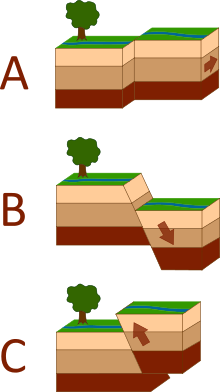 Once the rupture has initiated, it begins to propagate along the fault surface. The mechanics of this process are poorly understood, partly because it is difficult to recreate the high sliding velocities in a laboratory. Also the effects of strong ground motion make it very difficult to record information close to a nucleation zone. Most of the world's earthquakes (90%, and 81% of the largest) take place in the 40,000-kilometre (25,000 mi) long, horseshoe-shaped zone called the circum-Pacific seismic belt, known as the Pacific Ring of Fire, which for the most part bounds the Pacific Plate. Massive earthquakes tend to occur along other plate boundaries, too, such as along the Himalayan Mountains. With the rapid growth of mega-cities such as Mexico City, Tokyo and Tehran, in areas of high seismic risk, some seismologists are warning that a single quake may claim the lives of up to three million people. While most earthquakes are caused by movement of the Earth's tectonic plates, human activity can also produce earthquakes. Four main activities contribute to this phenomenon: storing large amounts of water behind a dam (and possibly building an extremely heavy building), drilling and injecting liquid into wells, and by coal mining and oil drilling. 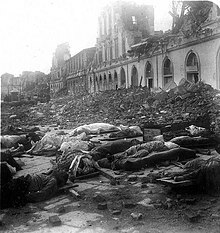 Perhaps the best known example is the 2008 Sichuan earthquake in China's Sichuan Province in May; this tremor resulted in 69,227 fatalities and is the 19th deadliest earthquake of all time. The Zipingpu Dam is believed to have fluctuated the pressure of the fault 1,650 feet (503 m) away; this pressure probably increased the power of the earthquake and accelerated the rate of movement for the fault. The greatest earthquake in Australia's history is also claimed to be induced by human activity: Newcastle, Australia was built over a large sector of coal mining areas. The earthquake has been reported to be spawned from a fault that reactivated due to the millions of tonnes of rock removed in the mining process. Earthquakes can produce slope instability leading to landslides, a major geological hazard. Landslide danger may persist while emergency personnel are attempting rescue. Tsunamis are long-wavelength, long-period sea waves produced by the sudden or abrupt movement of large volumes of water—including when an earthquake occurs at sea. In the open ocean the distance between wave crests can surpass 100 kilometers (62 mi), and the wave periods can vary from five minutes to one hour. Such tsunamis travel 600–800 kilometers per hour (373–497 miles per hour), depending on water depth. 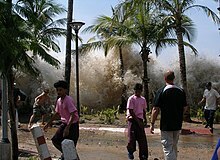 Large waves produced by an earthquake or a submarine landslide can overrun nearby coastal areas in a matter of minutes. Tsunamis can also travel thousands of kilometers across open ocean and wreak destruction on far shores hours after the earthquake that generated them. Floods may be secondary effects of earthquakes, if dams are damaged. Earthquakes may cause landslips to dam rivers, which collapse and cause floods. The objective of earthquake engineering is to foresee the impact of earthquakes on buildings and other structures and to design such structures to minimize the risk of damage. Existing structures can be modified by seismic retrofitting to improve their resistance to earthquakes. Earthquake insurance can provide building owners with financial protection against losses resulting from earthquakes Emergency management strategies can be employed by a government or organization to mitigate risks and prepare for consequences. Individuals can also take preparedness steps like securing water heaters and heavy items that could injure someone, locating shutoffs for utilities, and being educated about what to do when shaking starts. For areas near large bodies of water, earthquake preparedness encompasses the possibility of a tsunami caused by a large quake. From the lifetime of the Greek philosopher Anaxagoras in the 5th century BCE to the 14th century CE, earthquakes were usually attributed to "air (vapors) in the cavities of the Earth." Thales of Miletus (625–547 BCE) was the only documented person who believed that earthquakes were caused by tension between the earth and water. Other theories existed, including the Greek philosopher Anaxamines' (585–526 BCE) beliefs that short incline episodes of dryness and wetness caused seismic activity. The Greek philosopher Democritus (460–371 BCE) blamed water in general for earthquakes. 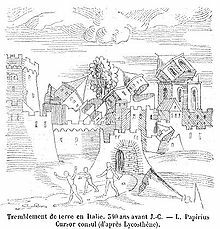 Pliny the Elder called earthquakes "underground thunderstorms." ^ Ohnaka, M. (2013). The Physics of Rock Failure and Earthquakes. Cambridge University Press. p. 148. ISBN 978-1-107-35533-0. ^ Spence, William; S.A. Sipkin; G.L. Choy (1989). "Measuring the Size of an Earthquake". United States Geological Survey. Archived from the original on 2009-09-01. Retrieved 2006-11-03. ^ Wyss, M. (1979). "Estimating expectable maximum magnitude of earthquakes from fault dimensions". Geology. 7 (7): 336–340. Bibcode:1979Geo.....7..336W. doi:10.1130/0091-7613(1979)7<336:EMEMOE>2.0.CO;2. ^ "Global Centroid Moment Tensor Catalog". Globalcmt.org. Retrieved 2011-07-24. ^ "Instrumental California Earthquake Catalog". WGCEP. Archived from the original on 2011-07-25. Retrieved 2011-07-24. ^ Hjaltadóttir S., 2010, "Use of relatively located microearthquakes to map fault patterns and estimate the thickness of the brittle crust in Southwest Iceland"
^ "Reports and publications | Seismicity | Icelandic Meteorological office". En.vedur.is. Retrieved 2011-07-24. ^ Schorlemmer, D.; Wiemer, S.; Wyss, M. (2005). "Variations in earthquake-size distribution across different stress regimes". Nature. 437 (7058): 539–542. Bibcode:2005Natur.437..539S. doi:10.1038/nature04094. PMID 16177788. ^ Talebian, M; Jackson, J (2004). "A reappraisal of earthquake focal mechanisms and active shortening in the Zagros mountains of Iran". Geophysical Journal International. 156 (3): 506–526. Bibcode:2004GeoJI.156..506T. doi:10.1111/j.1365-246X.2004.02092.x. ^ Nettles, M.; Ekström, G. (May 2010). "Glacial Earthquakes in Greenland and Antarctica". Annual Review of Earth and Planetary Sciences. 38 (1): 467–491. Bibcode:2010AREPS..38..467N. doi:10.1146/annurev-earth-040809-152414. ^ "M7.5 Northern Peru Earthquake of 26 September 2005" (PDF). National Earthquake Information Center. 17 October 2005. Retrieved 2008-08-01. ^ Greene II, H.W. ; Burnley, P.C. (October 26, 1989). "A new self-organizing mechanism for deep-focus earthquakes". Nature. 341 (6244): 733–737. Bibcode:1989Natur.341..733G. doi:10.1038/341733a0. ^ Foxworthy and Hill (1982). Volcanic Eruptions of 1980 at Mount St. Helens, The First 100 Days: USGS Professional Paper 1249. ^ Watson, John; Watson, Kathie (January 7, 1998). "Volcanoes and Earthquakes". United States Geological Survey. Retrieved May 9, 2009. ^ a b National Research Council (U.S.). Committee on the Science of Earthquakes (2003). "5. Earthquake Physics and Fault-System Science". Living on an Active Earth: Perspectives on Earthquake Science. Washington, DC: National Academies Press. p. 418. ISBN 978-0-309-06562-7. Retrieved 8 July 2010. ^ a b "What are Aftershocks, Foreshocks, and Earthquake Clusters?". Archived from the original on 2009-05-11. ^ "Repeating Earthquakes". United States Geological Survey. January 29, 2009. Retrieved May 11, 2009. ^ "Earthquake Swarms at Yellowstone". United States Geological Survey. Retrieved 2008-09-15. ^ Duke, Alan. "Quake 'swarm' shakes Southern California". CNN. Retrieved 27 August 2012. ^ Amos Nur; Cline, Eric H. (2000). "Poseidon's Horses: Plate Tectonics and Earthquake Storms in the Late Bronze Age Aegean and Eastern Mediterranean" (PDF). Journal of Archaeological Science. 27 (1): 43–63. doi:10.1006/jasc.1999.0431. ISSN 0305-4403. Archived from the original (PDF) on 2009-03-25. ^ "Earthquake Storms". Horizon. 1 April 2003. Retrieved 2007-05-02. ^ The USGS policy for reporting magnitudes to the press was posted at USGS policy Archived 2016-05-04 at the Wayback Machine, but has been removed. A copy can be found at http://dapgeol.tripod.com/usgsearthquakemagnitudepolicy.htm. ^ a b "Earthquake Facts". United States Geological Survey. Retrieved 2010-04-25. ^ a b Pressler, Margaret Webb (14 April 2010). "More earthquakes than usual? Not really". KidsPost. Washington Post: Washington Post. pp. C10. ^ "Earthquake Hazards Program". United States Geological Survey. Retrieved 2006-08-14. ^ "Seismicity and earthquake hazard in the UK". Quakes.bgs.ac.uk. Retrieved 2010-08-23. ^ "Italy's earthquake history." BBC News. October 31, 2002. ^ "Common Myths about Earthquakes". United States Geological Survey. Archived from the original on 2006-09-25. Retrieved 2006-08-14. ^ Are Earthquakes Really on the Increase? Archived 2014-06-30 at the Wayback Machine, USGS Science of Changing World. Retrieved 30 May 2014. ^ "Earthquake Facts and Statistics: Are earthquakes increasing?". United States Geological Survey. Archived from the original on 2006-08-12. Retrieved 2006-08-14. ^ The 10 biggest earthquakes in history, Australian Geographic, March 14, 2011. 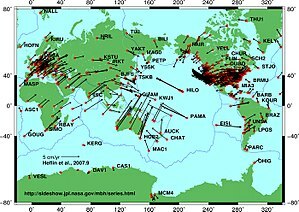 ^ "Historic Earthquakes and Earthquake Statistics: Where do earthquakes occur?". United States Geological Survey. Archived from the original on 2006-09-25. Retrieved 2006-08-14. ^ "Visual Glossary – Ring of Fire". United States Geological Survey. Archived from the original on 2006-08-28. Retrieved 2006-08-14. ^ Jackson, James, "Fatal attraction: living with earthquakes, the growth of villages into megacities, and earthquake vulnerability in the modern world," Philosophical Transactions of the Royal Society, doi:10.1098/rsta.2006.1805 Phil. Trans. R. Soc. A 15 August 2006 vol. 364 no. 1845 1911–1925. ^ "Global urban seismic risk." Cooperative Institute for Research in Environmental Science. ^ Madrigal, Alexis (4 June 2008). "Top 5 Ways to Cause a Man-Made Earthquake". Wired News. CondéNet. Retrieved 2008-06-05. ^ "How Humans Can Trigger Earthquakes". National Geographic. February 10, 2009. Retrieved April 24, 2009. ^ Brendan Trembath (January 9, 2007). "Researcher claims mining triggered 1989 Newcastle earthquake". Australian Broadcasting Corporation. Retrieved April 24, 2009. ^ "Speed of Sound through the Earth". Hypertextbook.com. Retrieved 2010-08-23. ^ "Newsela | The science of earthquakes". newsela.com. Retrieved 2017-02-28. ^ Geographic.org. "Magnitude 8.0 - SANTA CRUZ ISLANDS Earthquake Details". 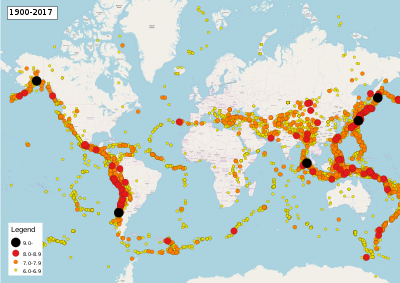 Global Earthquake Epicenters with Maps. Retrieved 2013-03-13. ^ "Earth's gravity offers earlier earthquake warnings". Retrieved 2016-11-22. ^ "Gravity shifts could sound early earthquake alarm". Retrieved 2016-11-23. ^ "On Shaky Ground, Association of Bay Area Governments, San Francisco, reports 1995,1998 (updated 2003)". Abag.ca.gov. Archived from the original on 2009-09-21. Retrieved 2010-08-23. ^ "Guidelines for evaluating the hazard of surface fault rupture, California Geological Survey" (PDF). California Department of Conservation. 2002. Archived from the original (PDF) on 2009-10-09. ^ "Natural Hazards – Landslides". United States Geological Survey. Retrieved 2008-09-15. 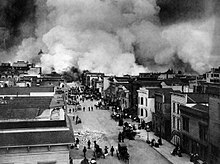 ^ "The Great 1906 San Francisco earthquake of 1906". United States Geological Survey. Retrieved 2008-09-15. 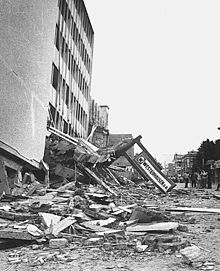 ^ "Historic Earthquakes – 1964 Anchorage Earthquake". United States Geological Survey. Archived from the original on 2011-06-23. Retrieved 2008-09-15. 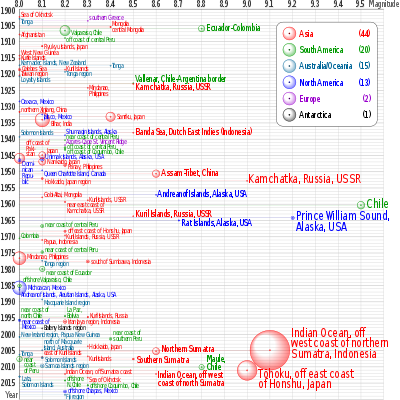 ^ "Notes on Historical Earthquakes". British Geological Survey. Archived from the original on 2011-05-16. Retrieved 2008-09-15. ^ "Fresh alert over Tajik flood threat". BBC News. 2003-08-03. Retrieved 2008-09-15. ^ "Earthquake Resources". Nctsn.org. Retrieved 2018-06-05. ^ Kanamori Hiroo. "The Energy Release in Great Earthquakes" (PDF). Journal of Geophysical Research. Archived from the original (PDF) on 2010-07-23. Retrieved 2010-10-10. ^ USGS. "How Much Bigger?". United States Geological Survey. Retrieved 2010-10-10. ^ Earthquake Prediction. Ruth Ludwin, U.S. Geological Survey. ^ Kanamori 2003, p. 1205. See also International Commission on Earthquake Forecasting for Civil Protection 2011, p. 327. ^ Pailoplee, Santi (2017-03-13). "Probabilities of Earthquake Occurrences along the Sumatra-Andaman Subduction Zone". Open Geosciences. 9 (1): 4. Bibcode:2017OGeo....9....4P. doi:10.1515/geo-2017-0004. ISSN 2391-5447. ^ a b c d "Earthquakes". Encyclopedia of World Environmental History. 1: A–G. Routledge. 2003. pp. 358–364. ^ "Fire and Ice: Melting Glaciers Trigger Earthquakes, Tsunamis and Volcanos". about News. Retrieved October 27, 2015. ^ Sturluson, Snorri (1220). Prose Edda. ISBN 978-1-156-78621-5. ^ George E. Dimock (1990). The Unity of the Odyssey. Univ of Massachusetts Press. pp. 179–. ISBN 978-0-87023-721-8. ^ "Namazu". Ancient History Encyclopedia. Retrieved 2017-07-23. ^ a b c d Van Riper, A. Bowdoin (2002). Science in popular culture: a reference guide. Westport: Greenwood Press. p. 60. ISBN 978-0-313-31822-1. ^ JM Appel. A Comparative Seismology. Weber Studies (first publication), Volume 18, Number 2. ^ Goenjian, Najarian; Pynoos, Steinberg; Manoukian, Tavosian; Fairbanks, AM; Manoukian, G; Tavosian, A; Fairbanks, LA (1994). "Posttraumatic stress disorder in elderly and younger adults after the 1988 earthquake in Armenia". Am J Psychiatry. 151 (6): 895–901. doi:10.1176/ajp.151.6.895. PMID 8185000. ^ Wang, Gao; Shinfuku, Zhang; Zhao, Shen; Zhang, H; Zhao, C; Shen, Y (2000). "Longitudinal Study of Earthquake-Related PTSD in a Randomly Selected Community Sample in North China". Am J Psychiatry. 157 (8): 1260–1266. doi:10.1176/appi.ajp.157.8.1260. PMID 10910788. ^ Goenjian, Steinberg; Najarian, Fairbanks; Tashjian, Pynoos (2000). "Prospective Study of Posttraumatic Stress, Anxiety, and Depressive Reactions After Earthquake and Political Violence" (PDF). Am J Psychiatry. 157 (6): 911–916. doi:10.1176/appi.ajp.157.6.911. PMID 10831470. Archived from the original (PDF) on 2017-08-10. ^ Coates, SW; Schechter, D (2004). "Preschoolers' traumatic stress post-9/11: relational and developmental perspectives. Disaster Psychiatry Issue". Psychiatric Clinics of North America. 27 (3): 473–489. doi:10.1016/j.psc.2004.03.006. PMID 15325488. ^ Schechter, DS; Coates, SW; First, E (2002). "Observations of acute reactions of young children and their families to the World Trade Center attacks". Journal of ZERO-TO-THREE: National Center for Infants, Toddlers, and Families. 22 (3): 9–13. Chung, D.H.; Bernreuter, D.L. (1980), Regional Relationships Among Earthquake Magnitude Scales. , NUREG/CR-1457. Wood, H.O. ; Gutenberg, B. (6 September 1935), "Earthquake prediction", Science, 82 (2123): 219–320, Bibcode:1935Sci....82..219W, doi:10.1126/science.82.2123.219, PMID 17818812 .